Did you know it’s National thrift store day? I never heard of it honestly. However, I frequent the thrift stores often. 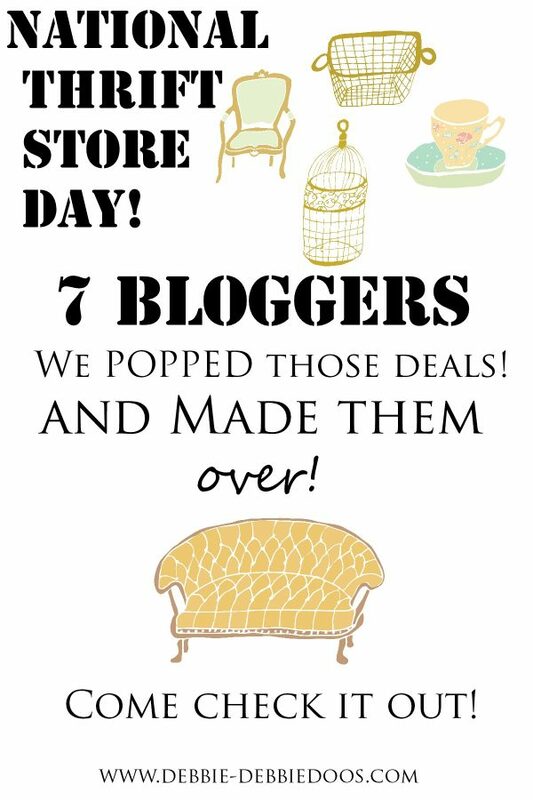 Today I am joining a few of my blogging pals and we are sharing some of our thrift store makeovers with y’all! So many found treasures we have that were once someone’s junk. and new ones to be told. In fact, my thrift store find I am sharing today actually had some roosters telling a story on it back in the day. This is actually a second redo on this lazy susan I found a few years back for a few bucks at Good will. I have been is serious clean out the cupboard mode around here. I still had tupperware with no lids from 1997 in my cupboards. I kid you not. That’s OK though, my husband the romantic bought me the new Mr. Lids as seen on TV and I am so happy he did. That is what motivated me to start purging. This was the first makeover you see. Painted and stenciled lazy susan. You may want to read that post, it’s corny but cute I guess. Out came the chalky paint. I thought with school coming the boys needed some organization in their bathroom. This is the perfect color. 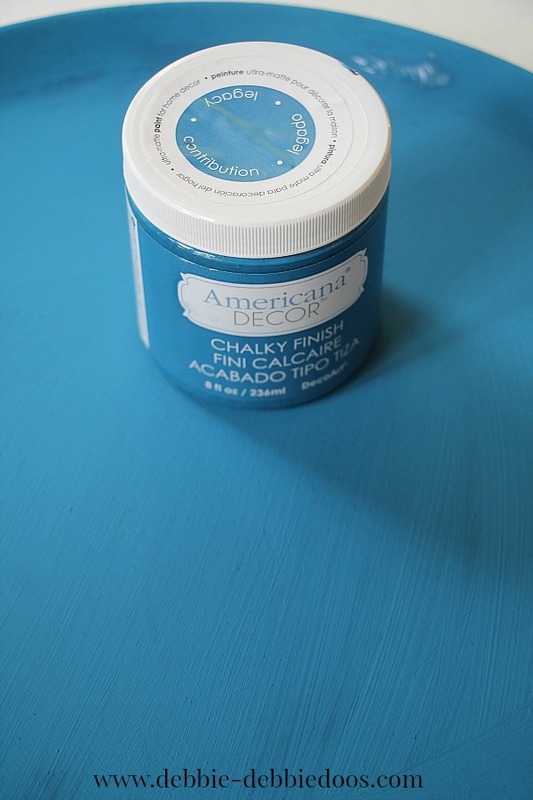 Legacy by Americana decor chalky paint sold at Home depot. 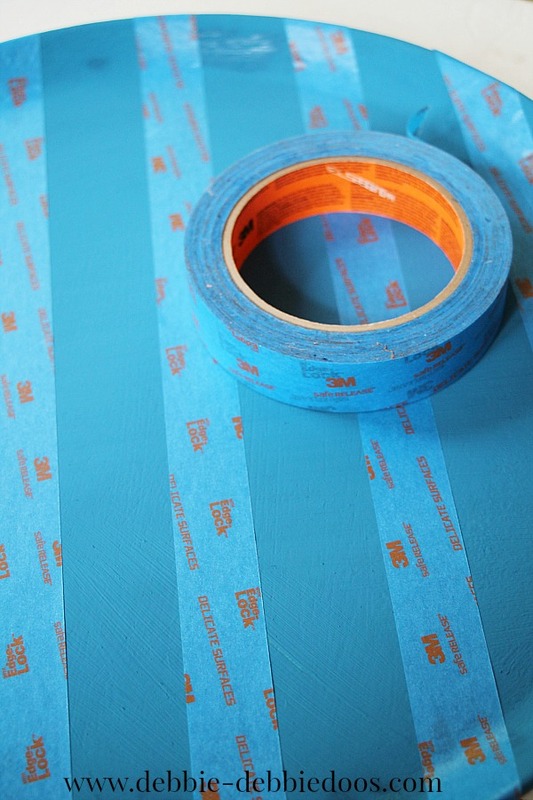 3M tape is the best imo. 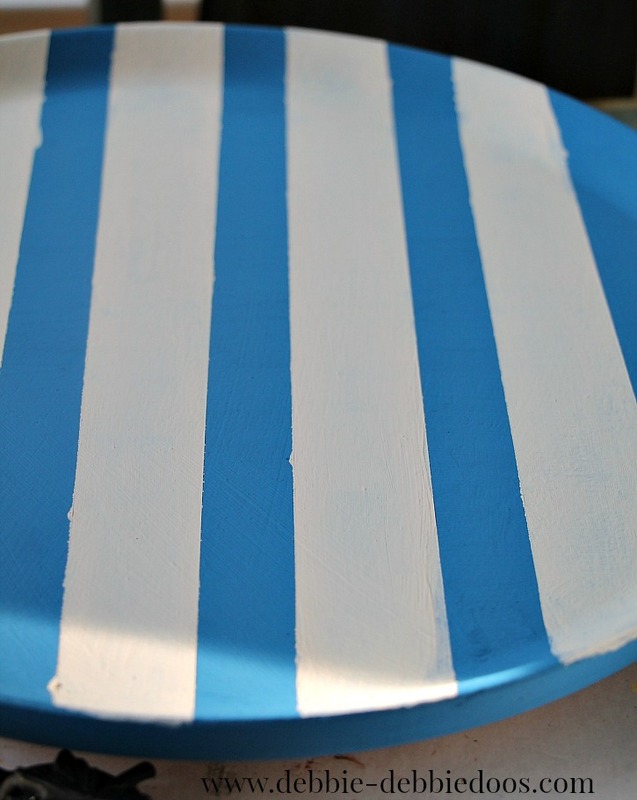 I wanted to make some stripes on the lazy susan so it had a more boyish coastal look for their bath. This was more of an off white color called Whisper. As you can see I had a bit of bleed through. Only because I was impatient and took the tape off before it completely dried. No worries though, nothing a little sanding won’t fix. After I lightly sanded it, I took the piece over to the sink to brush off the dustings with a paper towel. 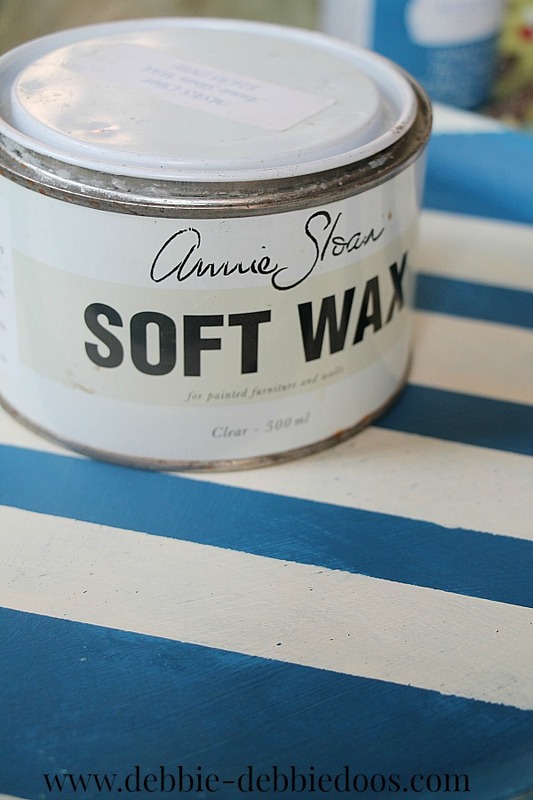 Finished it off with some clear wax by Annie Sloan. And now the boys have a perfect Lazy susan to put all their personal products on instead of all over the counter. Like my little Avon ducks? They are old, my Father gave me those years ago. He thought they were the greatest thing ever. OK, whatevs, I will use them somewhere. Thanks for stopping over. I hope you check out some of the other gals makeovers and scores as well. If you are not a regular here, I sure would love to have ya back! Who knew there was a national thrift store day!!!! This is great. Love the tray you did up. Very cool now I need to see what the others have done. Thanks for sharing this with us Debbie. Have a great week end. Very cute Debbie!! A tray always makes everything look so much nicer and neater. Wow it’s so chic! I love that Americana Decor paint. Smart idea to sand off any “accidents” too! Pinning. What is funny is that all the thrift stores around here are closed on Sunday! 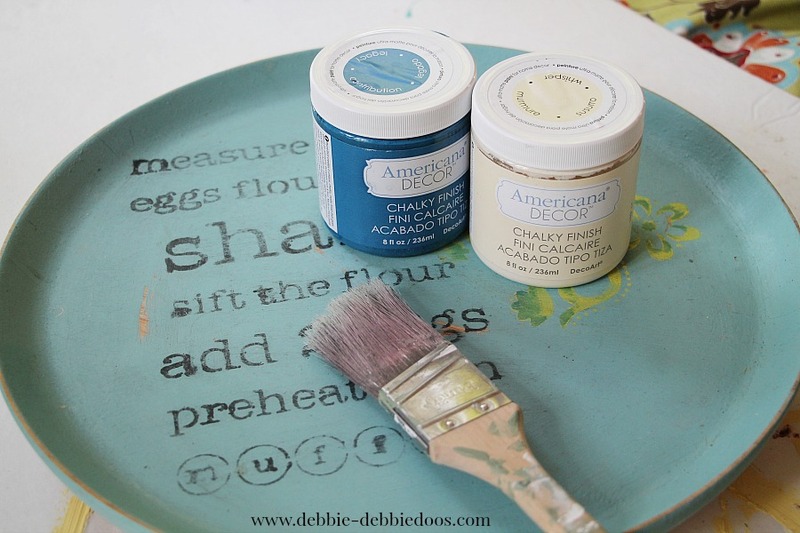 Love the paint on the lazy susan! Fun post! I admit, I am a tray hoarder too! Love the stripes Debbie! So fun seeing how pieces we collect get makeovers over time! Great to give new life. It would look cute in your house Ann:) I will remember that. Cute, cute idea, Debbie! You always come up with something fun. I think those little ducks are pretty darn cute! I never realized it had a lip until you just mentioned it. Yes, dig yours out Bev! They seem to be liking it, and the toiletries are remaining in one place. 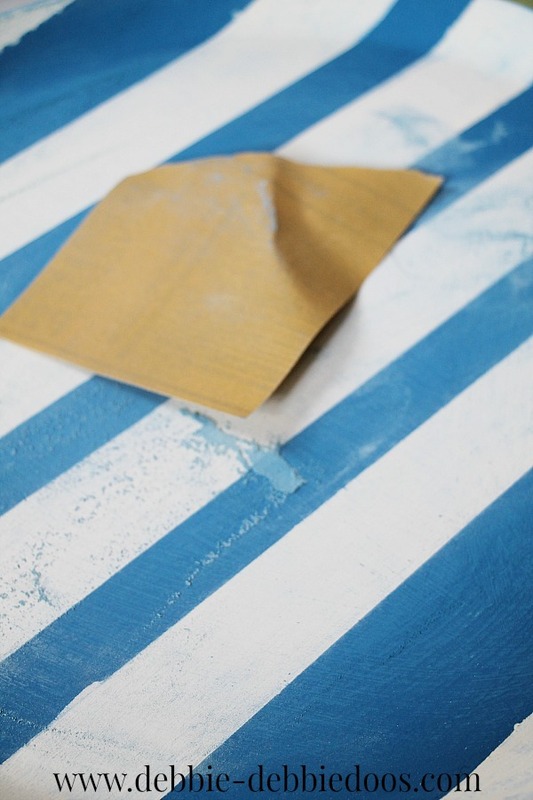 Those stripes give it a totally different feel that make it just perfect. I love how this is a twice-around makeover. That’s cute that your husband bought you lids for your tupperware and containers. I just love when a husband does something so thoughtful, it means he listens to you. So sweet! I love those lids too! He was like a little kid that day when he walked in with them. That is adorable! My son collects mallard ducks and just bought one on line and just received it this week. He is moving into college this Saturday and taking it with him. 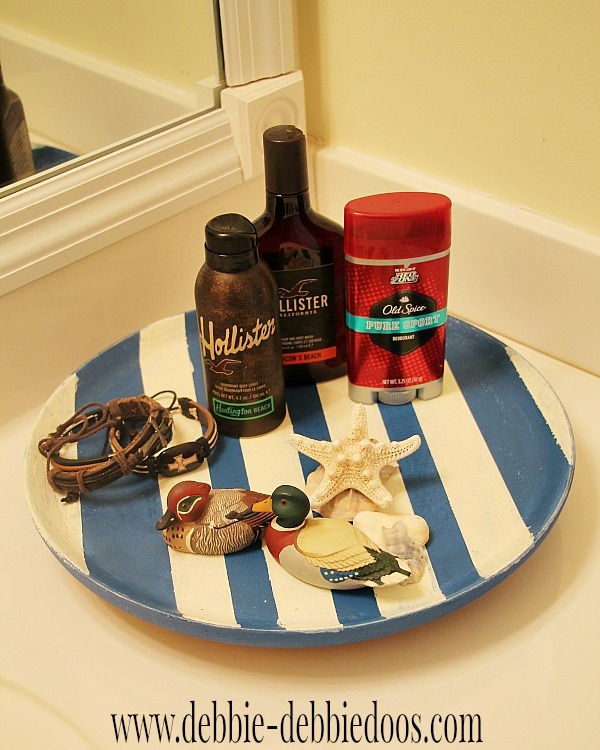 Such a cute idea for your boy’s bathroom.